Learn more about Clink Prison in England. Get information about its location, highlights and facts. The successive bishops of Winchester incarcerated heretics, prostitutes, priests, thespians and just about anybody who rubbed them the wrong way in this private prison from 1151. A miserable place where cells were regularly flooded by the nearby Thames, the Clink was burned to the ground during the Gordon Riots of 1780. 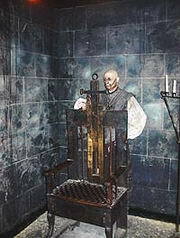 There are re-creations of the deplorable cells and hands-on displays of original and reproduction torture and restraining devices in three subterranean chambers on the original site. The Clink's gift shop, located in the Southwark area near London Bridge and Shakespeare's Globe Theatre, sells life-sized skulls, charm-bracelet torture devices and other macabre souvenirs.